Neo4j has powered the Paradise Papers release. Read on to see how journalists leveraged a graph database to quickly sift through the mountain of data they uncovered. Once again, the International Consortium of Investigative Journalists (ICIJ) has shaken the world with a far-reaching, in-depth investigation into the shadowy world of offshore finance: The Paradise Papers. 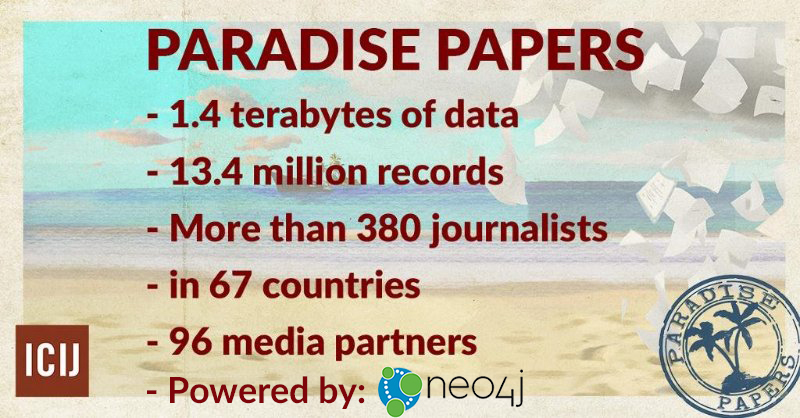 Using Neo4j, the ICIJ has built upon their Pulitzer Prize-winning investigation of 2016 — the Panama Papers — and they’ve begun to add politicians featured in early Paradise Paper reports to their Offshore Leaks Database. The new 1.4 TB of data — 13.4 million documents — includes information leaked from trust company Asiaciti and from Appleby, a 100-year-old offshore law firm specializing in tax havens as well as information leaked. The files were obtained by German newspaper Süddeutsche Zeitung and shared with Washington D.C.-headquartered ICIJ, a network of independent reporting teams around the world. As in previous investigations, Neo4j plays a key role in revealing the connections between the wealthy, their money, and the taxation-friendly countries in which it resides. The reason? Graph databases excel at managing highly connected data and complex queries. Instead of using tables the way a relational database does, graphs use special structures incorporating nodes, properties, and relationships to define and store data, making them highly proficient at analyzing the relationships and any interconnections between data and allowing journalists to “follow the money” easier than ever. According to Mar Cabra, the ICIJ’s Data and Research Unit Editor, using Neo4j was the only solution available to meet her requirements when they broke the Panama Papers investigation last year. 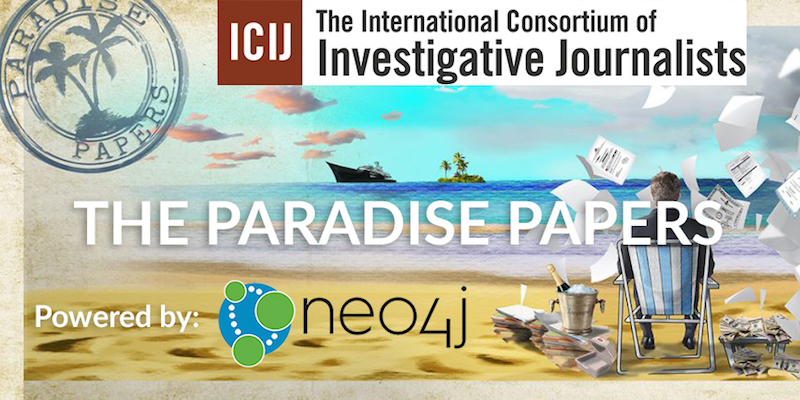 In the coming days and weeks, the Neo4j team will continue to unveil how graph technology powered the Paradise Papers investigation, including an in-depth look at the ICIJ data model with example queries, graph visualizations, and more. In the meantime, continue to follow the ICIJ’s Paradise Papers coverage exploring the political and economic dimensions of the investigation as they continue to unfold.